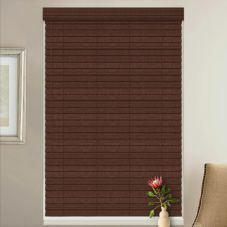 Wood blinds are classic, traditional, and elegant. They can add a richness and sophistication to any space. 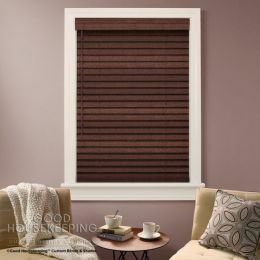 Because we know wood window treatments aren’t one-style-fits-all, we’ve made sure to offer a vast selection, giving you everything you need to find the perfect wood window blinds for your home and for your lifestyle. Wood window coverings are made from quality, natural hard woods, like basswood and American hardwood. They’re lightweight, making them perfect for large or wide windows. And because they’re lightweight, they won’t bow or bend as easily as other types of treatments. They’ll look great and last longer, giving you the most for your money. Just because wood and basswood blinds are made from natural materials doesn’t mean you're limited when it comes to colors and stains. With everything from bright white to dark cherry or mahogany, you’ll easily find the perfect color or stain to match your existing interior design, or to even create your dream design. With so many colors and stains to choose from, finding the perfect wooden window blinds has never been so easy. We’ve also made it simple to coordinate your wood window treatments throughout your entire house. 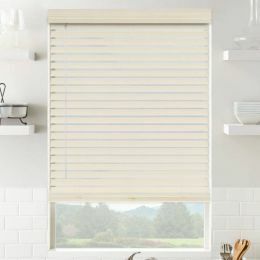 With 3 different slat sizes, including 1”, 2”, and 2 ½”, you can make sure every window and door has the right sized wood blinds, but still keep a consistent, continuous, streamlined design. Many of our wood window coverings come with an optional cordless lift system. 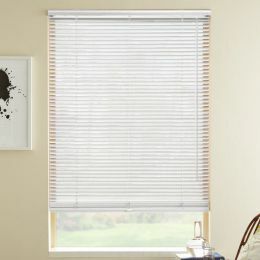 Cordless blinds are the safest way to go in homes with young children and pets. These cordless lift options are modern, convenient, and easy to use. If you have a wide window and you want to use multiple wood products instead of one large one, choose 2 or 3 products on a single headrail. The wooden window blinds will work independently, but the single headrail creates beautiful cohesion. Sharing a headrail makes it easier to raise and lower the wooden slat blinds, and it keeps them from being too heavy and guards against bowing or damage.